The Emerson Wine Cooler is a countertop unit with features which include a transparent tempered glass door, an LED display for temperature, and an adjustable temperature control. The feet can be set to level the bottles inside. The unit has a stainless steel look and comes with an interior light. The thermoelectric cooling system and advanced heat dissipation system is environmentally friendly. Its compressor-free design offers quiet,vibration-freeoperation. The maximum bottle length the unit can contain is 13 inches. Wider bottles mean fewer bottles will fit inside the cooler. People who have owned the cooler report many issues, from blower problems to temperature accuracy. Where problems concern getting the temperature to go below a certain setting, this may be due to the thermoelectric cooling system limitations. Wine requires a stable temperature to preserve its flavor and complexities. Serving at the proper temperature allows the aroma and subtle flavors to come through and their proper expression is part of the enjoyment of the drink. 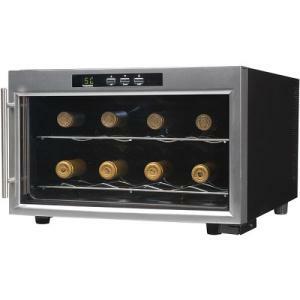 The cooler would possibly be adequate to chill a bottle, but may not be able to properly cool wine to preserve its peak quality, and the unit doesn't control humidity. Here's another freestanding model to consider by Wine Enthusiast. First notice water spots under my cooler. Then temperature would get cooler than 54 degrees, then it just stopped functioning. Is there anything I can do?